The client desired a contemporary, white, entertainer’s kitchen with stand out features for his family’s new home. An open brief was otherwise provided to the design consultant to bring this room to life. 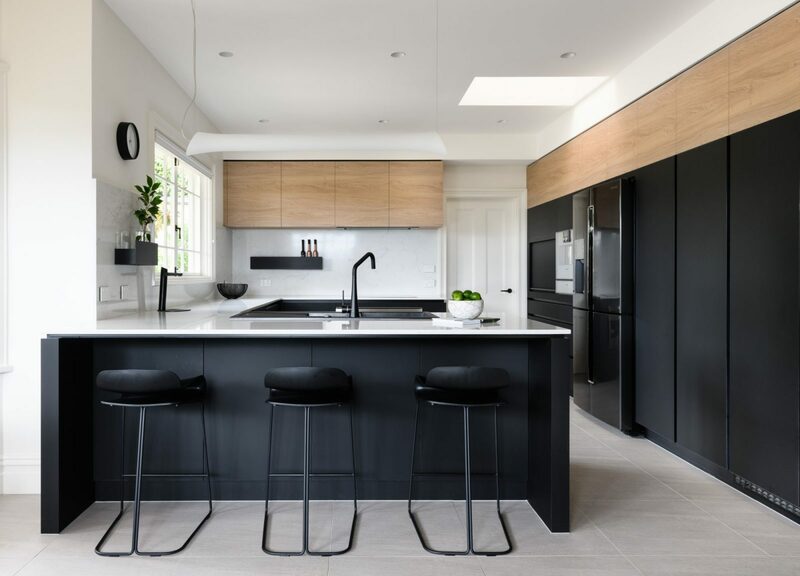 The luxurious spaciousness of this new home necessitated a kitchen that could match it in impact. Several designs were presented to the client until the design layout and finishes provided the desired combination of family and entertainer’s kitchen. 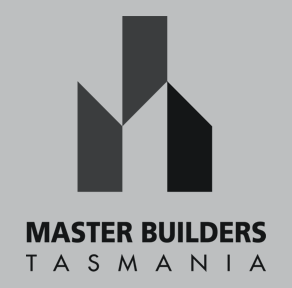 Stand out features include the grey engineered stone island bench, oversized mirror splashback with steel canopy (exhaust fan), mid-level trio side-by-side of cooking appliances, drinks’ fridge and LED lighting on the kickboard. 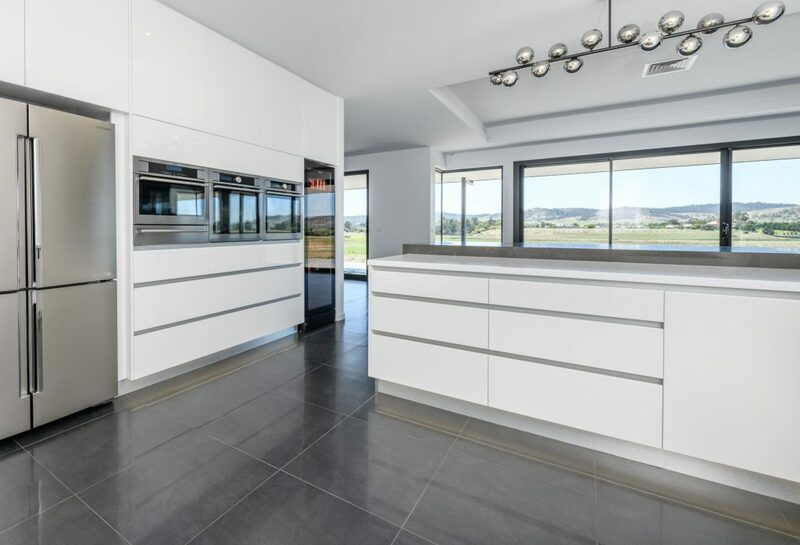 The white solid surface acrylic bench tops and 2-pack cabinets contrast with the brushed aluminium shadow join handles. 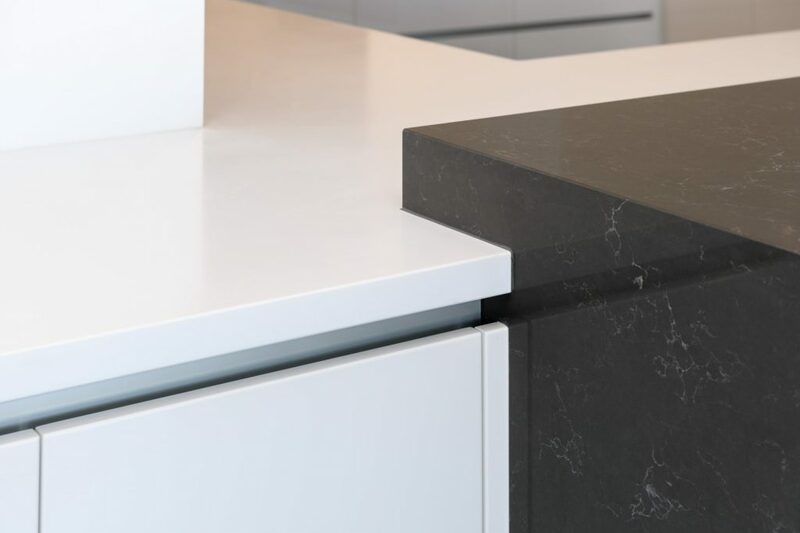 Despite the impressive size of the kitchen bench, there are no visible joins due to the solid surface acrylic used, assisting with the clean, steamline style of the kitchen. 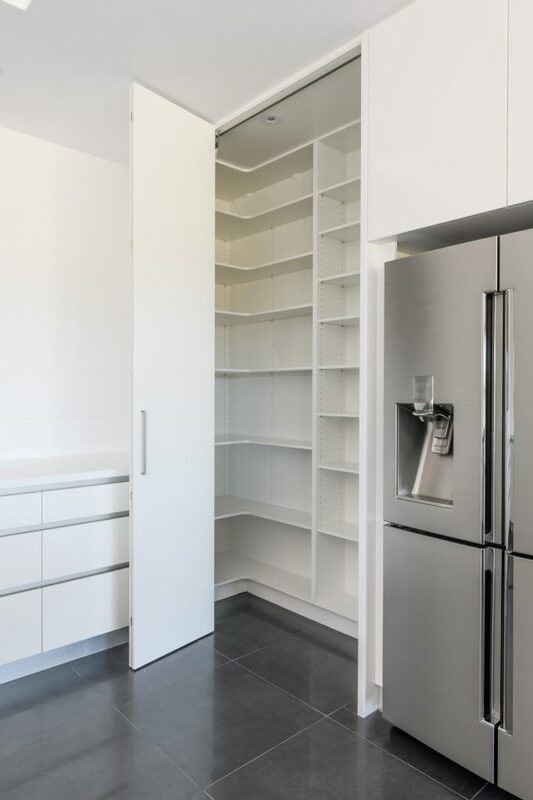 Extensive drawers and bench space, walk-in pantry, island bench seating, wide entry access, two ovens, microwave oven, warming drawer and easy access to two fridges fulfil the entertainer’s needs. The integrated sideboard adjoining the island bench provides dedicated space for storing personal items such as phones and keys. 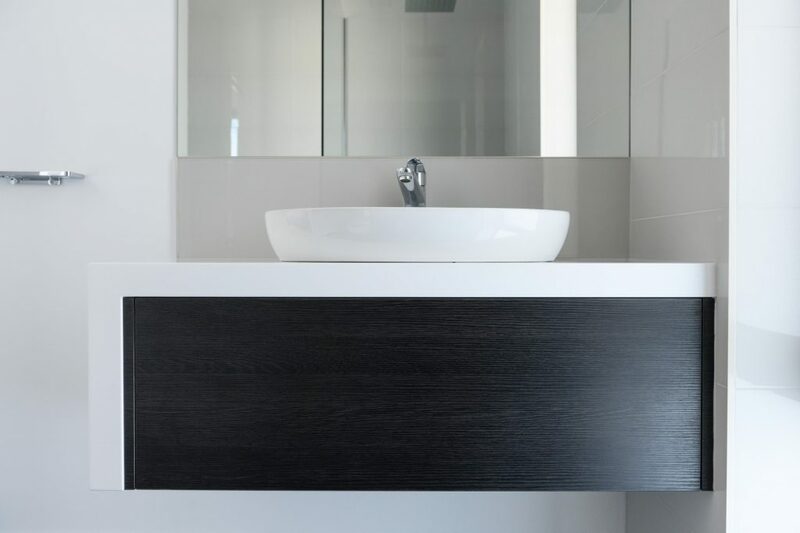 A consistent yet individually tailored style was used across the seven bathroom vanities which were finished in solid surface acrylic and melamine. Floating vanities were used to again emphasise the spaciousness and contemporary style of the home. 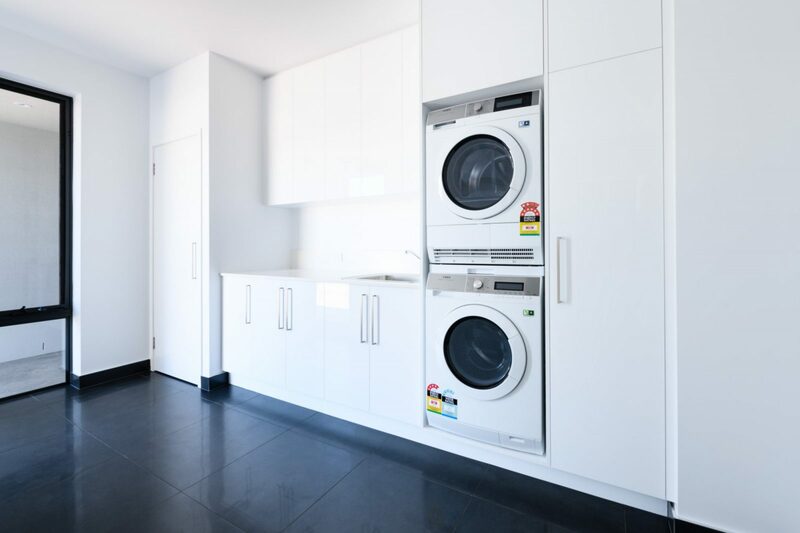 The laundry, finished in gloss melamine, provides a functional and easily maintained space.